HR managers, gather ‘round the fire for a truly scary ghost story. You’re trying to hire a few employees to fill crucial gaps in your company. You’ve talked to several promising candidates and are feeling pretty good about your odds of filling the positions quickly. Then, one by one and out of nowhere, these potential hires stop answering your calls and emails. With no notice at all, they’ve gone silent. This scenario is becoming more and more common in the current competitive hiring market. Because there are more open positions than qualified candidates to fill them, job seekers feel emboldened to drop the conversation with recruiters as soon as they lose interest in a company or a position. In fact, according to a recent survey, 41% of job hunters believe it’s reasonable for a candidate to ghost a company. However, the reverse does not apply: in the same survey, 35% of respondents said that they consider it unacceptable for companies to ghost applicants. While this double standard may seem unfair, companies have a responsibility to protect their reputations by creating as positive a candidate experience as possible for job applicants. That means no long silences, no drawn-out interview processes, and avoiding other recruiting worst practices that turn off job applicants. Reducing your time-to-hire is a great way to increase productivity and save your company money that’s wasted on a protracted search for the right employee. It’ll also help you avoid letting the most exciting candidates don’t slip through your fingers. Do an internal audit to see what steps in your company’s recruiting process hinder your ability to make quick and deliberate moves, and shorten or eliminate them if possible. It may be a good idea to invest in technological solutions to speed up your recruiting and hiring processes. Ideally, when you find a candidate whose skills and experience catch your eye, you should reach out within a day or two to start a conversation. Waiting around for a big enough pool of resumes to pile up before going through any of them will frustrate your early applicants, who are likely to move their focus to companies who show an interest quickly. Uncertainty is a major driving factor behind candidate ghosting. Even if an applicant is interested in your company and the open position, they’re more likely to abruptly end the conversation if they don’t have an idea of your timeline— especially if another company is being more communicative. Commit to informing job candidates of your decision-making timeline up front; if it’s longer than they’d like to wait, they can bow out early, but they’ll certainly appreciate your honesty. Many companies like to tout their cultural bells and whistles for job candidates: catered lunches, a cool workspace, and unlimited vacation policies are commonly-listed perks on job posts. While these are cool things to provide your employees— and they may help candidates decide between two competing job offers— they do nothing to help a potential employee imagine their day-to-day work. The truth is, the best job candidates aren’t the ones who will choose your company because of happy hours and foosball tables. They want to do work that excites them, that helps them achieve personal and professional goals, and that they find fulfilling. Focusing your job listing and early conversations on the possibilities of the role will help job seekers to picture how their work would help further the company’s goals, and where they’d fit into the culture of the organization. Once they’ve developed a compelling mental image of themselves in the role, job candidates are far less likely to disappear from the conversation. Be honest: before the current tight hiring market, your company probably left candidates on the hook without ever communicating any kind of timeline for hiring, or letting them know about your final decision. You’re busy people, after all. Onboarding and training your new hire probably seemed more pressing (and more exciting) than going back and having unpleasant conversations with people who weren’t chosen. But after years of struggling to get traction with hiring managers, job seekers have been trained to see this behavior as common— which may explain why they’re likely to walk away from ongoing conversations with hiring managers now. 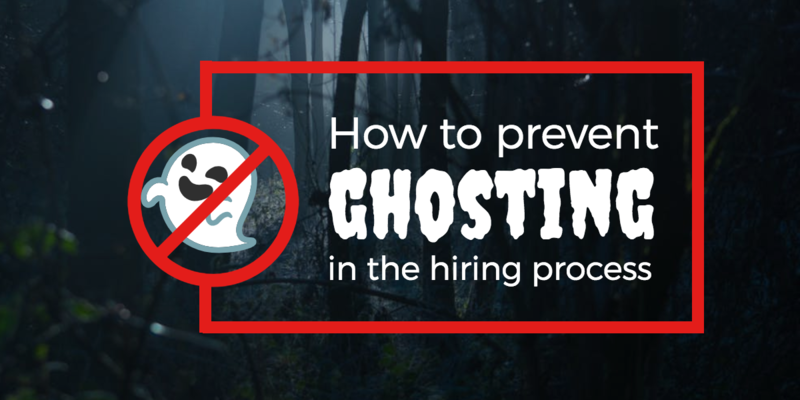 HR professionals unintentionally set a cultural expectation that ghosting was a normal part of the hiring process, and undoing the damage will involve intentionally creating new norms. Once you’ve decided to eliminate a candidate from consideration or you’ve made your final hiring decision, reach out to each person who’s interviewed for the role to let them know and to thank them for their time. These conversations don’t have to be long, but the personal touch will speak volumes about your company’s priorities. Not only will this preserve your reputation among job seekers (and in turn reduce the likelihood that future applicants will ghost you), but it’ll help undo some of the lasting toxic effects caused by years of widespread inconsiderate hiring practices.